There’s no such thing as too much Iron & Wine” ~ myself, ages ago. 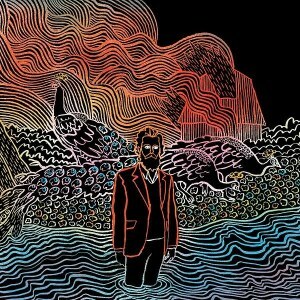 The new Iron & Wine album, Kiss Each Other Clean is brilliant. To follow up from 2007’s The Shepard’s Dog, an album that’s so refined and rich with wide open spaces (basically, one of mankind’s finest moments), would take super-human skills. Consider it done. This is a brave new sound, and although it’s been a logical progression there’s clearly been a huge advancement in the band’s confidence. From the humble beginnings of a man with a golden voice and a guitar, Samuel Beam’s sound has steadily grown to include other musicians and studio wizardry. Kiss Each Other Clean continues in this vein whilst catapulting Iron & Wine right out of the indie-folk box. There’s a myriad of new instruments all clamouring for attention (including brass, synths and a flute) and they all want to play 70’s era rock, funk or reggae…or just make a noise. But don’t fear. Sam Beam’s voice has the ability to cut through anything. The songwriting is braver than ever, and Kiss Each Other Clean is also beautifully constructed and produced. As with every Iron & Wine album, there is immense beauty in Sam Beam’s wounded and courageous poetry, but there’s also plenty of restrained anger. From the sublime “Cause a rabbit will run, and a pig has to lay in it’s piss” on ‘Rabbit Will Run’ (such a fine moment on the album) to the epic 7 minute closer ‘Your Fake Name Is Good Enough for Me’ describing what we have become, risks have been taken, and all of a sudden Iron & Wine are throwing punches on a different level. I never thought Iron & Wine was capable of an opus the magnitude of Your Fake Name, but I was wrong, and I’m amazed. Traditional fans may not be too impressed with the new sound, but that would have more to do with what they expected to hear. Artists need to evolve if they’re any good, and to cling to a sound that is familiar is selfish. Nothing has changed in terms of Samuel Beam’s incredibly melodic songwriting skills, and if you’re in any doubt about that just head over to the Iron & Wine Daytrotter session to download a selection of these songs in all their naked, non-produced glory. Kiss Each Other Clean is a magnificent album of immense proportion, and with it they assert their place amongst musical nobility. Order it from Iron & Wine’s website.